Earsham is a large parish in the district of South Norfolk, located in the valley of the River Waveney, which forms the boundary between Norfolk and Suffolk. 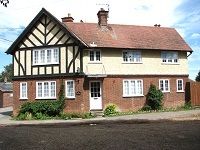 Much of the parish is still owned by the Earsham Hall Estate, which is currently home to the Earsham Pine Company and comprises a furniture and antiques shop and a tearoom. Local attractions highlighted by Wikipedia include Earsham Mill, a water mill dating from Anglo-Saxon times - derelict for many years and in recent years converted into the Atlantic Superstore; the Otter Trust, founded in 1971 by Philip and Jeanne Wayre and hailed as the oldest and largest otter conservation centre in the world - now closed; and The Queens Head public house, home to the Waveney Brewing Company, and still trading. Earsham also once had a railway station (on the Waveney Valley Line) but the railway line was closed on 19 April 1966 and many of the remaining buildings and goods yards were demolished in the early 1980s. 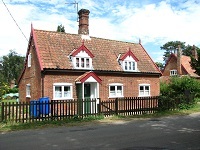 The Earsham station building was converted to a private dwelling. The railway track was lifted and built over and the Bungay/Earsham bypass (opened in November 1983), the A143, aptly named the Old Railway Road, now follows its course from Bungay to Harleston. The Norfolk Historic Environment Record (NHER) records a 3rd class landing ground to have existed in the fields adjacent to Pheasants Walk in the west and that, according to their informant "the farm was bombed in a Zeppelin raid presumably aimed at the airfield", unfortunately without clarifying which one of the two farms in the vicinity - Camphill Farm in Middle Road, and Earsham Park Farm, further south-west on the other edge of the alleged landing ground and both marked on the 1905 map - had been hit. This information originates from a verbal communication with "the Norfolk and Suffolk Aviation Museum" (E Rose, 1980). Any additional information would seem to be based on one of NHER's infamous desk-based assessments, according to which several ring ditch cropmarks identified on aerial views supposedly confirm the existence of an "airfield" at this location (E Rose, 1986). Other sources however suggest that the crop marks are more likely to be part of a confirmed, dispersed Bronze Age barrow cemetery (J Albone, 2006). No trace remains of the landing ground, if it ever existed. During WW2, the crop fields, woods, farm tracks and even some of the public roads around Earsham were transformed into a huge bomb dump, bounded by the perimeter of Earsham Park in the south and extending northwards into the neighbouring parish of Hedenham. In 1936, the Air Ministry estimated a war reserve of 98,000 tons of bombs - 82,000 as 110 kg (250 lb) and 230 kg (500 lb) bombs and the balance in the form of incendiaries - to be sufficient, but only 48,000 tons were ever purchased. By 1938, the planning had been finalised and three underground depots, each of a capacity of approximately 25,000 tons and serving eight surface so-called Air Ammunition Parks, had been established. In 1941, the latter were renamed Forward Ammunition Depots, each with a nominal capacity of between 750 and 1,250 tons and intended to supply armaments to individual airfields. The demands on the depots however grew far beyond the planned capacities soon after the outbreak of hostilities and the site limits were consequently raised from 1,000 tons to 10,000 tons, and stores designed to hold 56 tons of bombs were by 1943 holding some 600 tons. Furthermore, within a week of war being declared, the RAF was also made responsible for the supply of shells for Army anti-aircraft guns located in the vicinity of RAF stations. Consequently, there was a constant search for more accommodation and storage and it became necessary to compromise even in the early days by reducing safety distances, increasing store capacity, and using public roads, ideally class B roads with wide verges, for the storage of bombs. In general these roads would be unguarded but they were closed at both ends to all except local residents with passes. Where possible, the stocks were covered with tarpaulins. The principal bomb in use before the war had been the 250 lb General Purpose bomb, but the steady increase in the weapon capacity now posed significant problems with regards to stacking, handling and the ability to store the bombs safely: a 250 lb bomb could be handled by a couple of men, but bombs weighing 500 lb, 1,000 lb and more required special handling aids. The heaviest bombs, the 'Tallboy' and the 'Grand Slam', weighed 12,000 and 22,000 lbs, respectively. 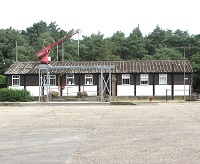 The main pre-war ammunition parks in East Anglia were Barnham > Link in Suffolk, which served RAF Bomber Command; Earsham, which served OTUs (Operational Training Units), both completed in 1939/40; and Hockering in the Breckland district of Norfolk > Link which was only completed in January 1943, in 2 Group RAF. The depots were tactically sited to store and receive directly from factories and ports, and to issue to local units, typically comprising 10 to 15 heavy bomber airfields, ideally located within a 42km (25 mile) radius. With the arrival of the USAAF (United States Army Air Forces), new depots were constructed to cater for its requirements but where rational, they were also assigned sub-sites at already existing depots, which required some re-brigading as the RAF moved from the selected bases. US military personnel also required to be instructed in the use of British infrastructure equipment, and training in RAF storage and safety procedures. 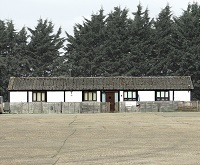 Earsham had initially been a RAF Forward Ammunition Depot (FAD) in No 42 (Maintenance) Group, Maintenance Command (the group responsible for fuels and explosives, formed on 1 January 1939 and disbanded at the end of 1955 - a detailed history of 42 Group can be read here: Link ), supplying munitions to OTUs and specifically to No 6 OTU, which had been formed in March 1940 at RAF Sutton Bridge for training fighter pilots. In November 1940, 6 OTU was redesignated as 56 OTU and remained at Sutton Bridge until the unit was transferred to RAF Tealing in Angus, Scotland, in March 1942. The RAF's Earsham FAD would subsequently seem to have been handed over to the USAAF, which reportedly arrived in February 1943 and redesignated the depot as AAF (American Air Forces) Station 545. Earsham had a capacity of 16.5 kilotons and served the RAF bases at Shipdham > Link - USAAF Station 115, Hardwick > Link - USAAF Station 104, Bungay > Link - USAAF Station 125 and Horsham St Faith - USAAF Station 123. The site headquarters (HQ) was located to the north of Earsham Hall and a wood known as The Wilderness, in a hutted camp near Hall Farm, which reportedly occupied an area measuring approximately 250 by 150 metres and was reached via what is now called Private Road - a private access road leading to Hall Farm and a couple of neighbouring dwellings. The HQ site comprised 40-odd buildings, including 22 Handcraft and 16 Nissen huts, latrines and ablution blocks. According to a document dated 31 March 1945, 14 officers and 468 men were accommodated there at the time. Buildings on the immediately adjacent Communal site included an Institute, a Dining room (housed in a Seco hut), a Ration store, a Drying room, a Sergeants' mess, and a Medical Inspection hut. There was also a fuel compound and a high-level water tank holding 10,000 gallons. The purpose-built sewage works adjoined in the east (site plan 3040/52). By the summer of 1973, most of the buildings had been demolished, and almost all of the remaining structures have not survived the more recent construction of a modern milking parlour and associated large sheds. 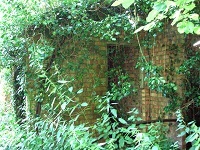 Two very dilapidated toilet blocks can however still be found on the edge of The Wilderness, with some of the toilet seats apparently still in their original positions although the walls around them have fallen down. 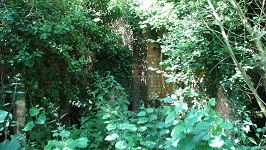 On the edge of the site, the borehole pump house (building 74A) has also survived. It is adjoined by a small room, perhaps serving the purpose of a tool room. On the other side of the camp just west of Norwich Road, two small buildings are still standing on the edge of the camp's sewage works of which nothing else remains. They are the Tool House (building 76) and the Destructor House (building 77). The latter accommodated a furnace for burning solid refuse. 1578 Quartermaster Truck Battalion (Aviation) - the unit transferred to Earsham from Sharnbrook (an ordnance and chemical depot in Bedfordshire) in May 1944 and moved, without personnel, to RAF Burtonwood (AAF Station 590) in Lancashire in May 1945. Burtonwood was the principal Base Air Depot area headquarters for the UK, and developed into the largest single US supply, storage, and maintenance installation of the war. 1578 Quartermaster Truck Battalion (Aviation) > 2217 Quartermaster Truck Company (Aviation) - the unit was activated on 11 March 1944 at AAF Station 545 (Earsham) to haul ammunition. Six drivers from the 2218 Quartermaster Truck Company delivered bombs to RAF Metfield > Link on 15 July 1944. During unloading one of the bombs fell on top of another which subsequently exploded, leading to a huge explosion on the bomb dump and killing five of the drivers, three of whom have no known grave as only small fragments of the men and their vehicles could be found. The explosion also destroyed more than 20 of the aerodrome's B-24 bomber aircraft and ruined almost all of the pressure sensitive instruments such as altimeters and manifold pressure gauges. The wheels guiding the hangar doors had come off their tracks and the doors were twisted by the force of the explosion, and windows were blown out in villages several miles distant. 1916 Ordnance Ammunition Company (Aviation) - the unit was activated on 25 August 1942 at Barnham (Suffolk) as 2 Provisional Ordnance Company Ammunition, and redesignated as 2014 Ordnance Ammunition Company (Aviation) on 23 February 1943. 2106 Ordnance Ammunition Battalion - the unit was activated as HQ and HQ Detachment and Medical Detachment 2017 Ordnance Ammunition Battalion, Aviation (Provisional) in February 1943; redesignated as 2106 Ordnance Ammunition, Aviation (SP = Special) on 15 March 1943; and redesignated as 2106 Ordnance Battalion (Aviation) on 20 April 1945. The bomb stores were dispersed in some of the woods, such as Beech Wood (to the east of the camp, in the parish of Earsham), Sexton Wood (in the north-west, in the parish of Hedenham) and Park’s Wood, and America and Great woods. 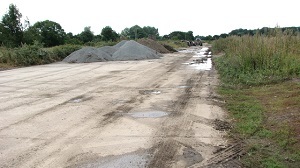 Roadside verges and concrete hardstandings were also used for the storage of munitions, and a number of existing farm roads, trackways and newly constructed concrete roads with hardstandings alongside them provided additional storage space. The perimeter of the dispersed facilities was protected by sentry posts located at strategical locations on the public roads leading into the area. Two storage areas are documented to have been located beside Denton Road, one being about 190 metres long and 14 metres wide and situated on a grass verge on the southern edge of Earsham Park. Another area of similar size can still be seen 260 metres further to the west, near where a concreted track known as Hogg Lane emerges on Denton Road. A Picket post stood a short distance further along the road a short distance east of Whitehouse Farm. HE (high explosive) ammunition was stored beside the road near here and there was also a hardstanding for the storage of incendiaries. According to the site plan there used to be a third bomb storage area just west of the Denton Road/Norwich Road junction. Like the others along this road it consisted of eight hardstandings or elevated platforms of which today no trace remains. Followed in north-westerly direction, Hogg Lane links with Whitehouse Lane which in turn emerges on Norwich Road further to the east. A number of hardstandings can still be seen along Hogg Lane, which today is a public footpath. Across the road from the Hogg Lane/Denton Road junction there is a concreted loop which was also used for the storage of bombs, with hardstandings on both sides. Most of these are now so overgrown that they can no longer be seen. 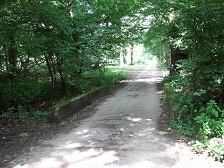 Near the accommodation camp and immediately adjoining Hall Road in the north there is a small wood known as Beech Wood, which at the time was more sparsely wooded than at present and served as one of the depot's bomb stores. 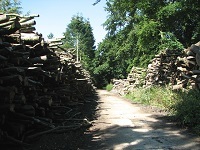 NHER have recorded the concrete road traversing this wood in a loop and the hardstandings alongside it, as well as three buildings in the south-west corner (J Albone, 2006). The site plan however shows five buildings near the south-eastern corner and three, including a very long structure just north-west of the site entrance. This building (building #100) is still in place and described in more detail below. The munitions stored in Beech Wood were bombs and incendiaries. The looped concrete road, the adjacent hardstandings and a large Handcraft hut are all still in place. Only a small heap of rubble, however, remains of the brick-built Picket post beside the entrance. 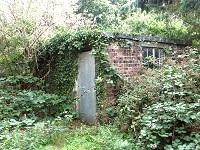 A small wooden hut, which would seem to have been equipped with a telegraph connection at some time in the past, still stands opposite it, on the other side of the gate. According to locals the structure served as a guard hut, but this has as yet to be confirmed. 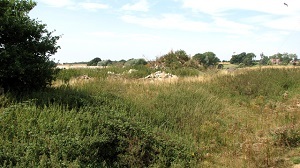 The site plan marks a Picket post opposite it, on the other side of the site entrance and there is indeed a heap of brick and concrete rubble still in place at this location. Small Arms ammunition for machine guns and cannon came in two configurations, belted and unbelted. Belted, as supplied, was usually one type such as Ball (solid bullet) each round joined to another by a metal link forming a flexible belt. Aircraft operations in particular required 'mixed' belts, for example 3 Ball, 1 Tracer, 1 Incendiary, repeated through the length of the belt. To meet changing requirements, both supply depots and airfield armouries had ammunition belting machines and boxes of loose ammo and links and they assembled their own. The simplest machines were hand cranked, the fancier ones electrically driven. Some electric machines could be loaded with both links and rounds and performed the actions of joining the links, clipping in the rounds and positioning. In the absence of any type of machine, belts were made up entirely by hand by a team and each round individually and accurately positioned within its link, using a simple lever-operated hand tool. Clean flat benches in a warm dry room facilitated this. To enable a simple production line, lengths of flat top benches would be laid end to end and a group of men assembled to join empty links in a chain, fill them with the required sequence of rounds and then pass them through the machine, which ensured that each round was correctly positioned within its link, critical to avoid feed and stoppage problems. Belts would be made up in short lengths of (say) fifty rounds for ease of handling, and then belts joined by hand during the gun loading at the aircraft. 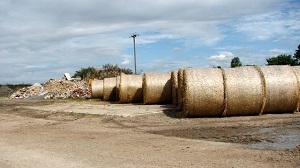 At storage depots such as Earsham a dedicated building was configured for Belt Linking or Belt Filling. Special small arms (SAA) and HE ammunition were stored on hardstandings beside Hall Road, along Pheasants Walk (both public roads) and in New Plantation, adjacent to it in the west. At least eleven hardstandings existed along the eastern grass verge of Pheasants Walk. 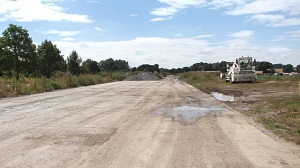 A 350m length of the verge beside Five Acre Lane, which turns off Pheasants Walk, was surfaced and used as the car park of the MT (Motor transport) section. Today the lane is a public footpath and no trace remains of the parking bays. 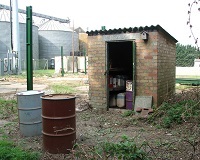 The MT section's petrol installation, a 5,000 gallon fuel tank, was located on Bullockshed Knoll, adjacent to the junction of Five Acre Lane and Pheasants Walk. A Picket post, of which no trace remains, guarded the road junction, and opposite it there stood a Components store. 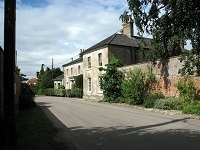 All other sites were situated to the north of Earsham Hall. A Picket post stood by the junction of Earsham and Sexton roads in the village of Hedenham, at the northern perimeter of the site, and a number of buildings, including three sleeping huts and a Canteen combined with a kitchen, were located on the verge beside the road a short distance further to the south. No trace remains today. The hardstanding of two Nissen huts housing one of the Compound Store can however still be seen at the end of Spink's Lane (a public road turning off Earsham Road), near its junction with Lang Gate Way, where another Compound Store was situated. No munitions were stored on Spink's Lane. Sexton Road skirts the eastern edge of Sexton Wood and is the access road to Sexton Wood Farm, a road open to all traffic although it peters out into a footpath south of the farm, which in the 1940s was known as Woodhouse Farm. There are a number of hardstandings used for the storage of bombs beside Sexton Road and also along the southern section of Lang Gate Way which here is a public footpath and links with Whitehouse Lane further south. HE ammunition and Special SAA were stored in Lang Gate Way. 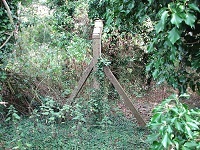 A Picket post was located by a sharp bend in Pound Lane, a rural lane east of Earsham Road, and another one stood at the junction of Spink's Lane and Lang Gate Way. 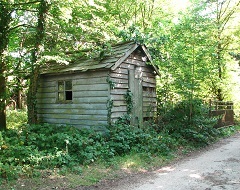 Two WD (Wireless direction finding) huts, associated with an abandoned searchlight post, were located in a field adjacent to Park's wood in the north. No trace remains today of any of these buildings. 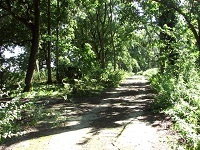 Sexton Wood, located in the parish of Hedenham, is the largest wood in the area and one of the largest woods in south-east Norfolk and was designated an SSSI (Site of Special Scientific Interest) in 1983, as it is considered to be almost entirely of ancient origins. The standard trees to be found there are oak (Quercus robur) interspersed by hornbeam (Carpinus betula) and suckering elm (Ulmus sp), with the areas of high forest chiefly of oak over a ground flora of bracken. The coppice comprises hornbeam, ash (Fraxinus excelsior), field maple (Acer campestre) and sallow (Salix caprea). Shrub species present include midland hawthorn (Crataegus laevigata), spindle-tree (Euonymus europeaus) and guelder rose (Viburnum opulus). During the war years, the wood, not least due to its size, was the Earsham FAD's main storage area, used exclusively for the storage of HE ammunition, and still contains the original network of concrete roads and hardstandings. Four buildings, of which only traces remain on the ground, were located near the eastern edge and two Nissen huts, Compound Stores, stood nearby. Two Component huts were located a short distance further to the south-west, roughly at the wood's centre. No trace remains of these huts but the Compound Stores (buildings 63A and 63B) have survived in good condition and are currently in farm use. A much smaller wood further to the south-east, known as Park's Wood, also served as a bomb dump and only HE ammunition was stored there. The concrete road traversing it turned north-westerly and, traversing crop fields, linked with Lang Gate Way, with munitions stored all alongside it. Today only the track and hardstandings within the wood remain in place albeit much overgrown. NHER has recorded the curving concrete road and also various pitched roof and Nissen hut type buildings of which no trace remains. Aerial views taken by the RAF in 1946 also show a Blister hangar in the fields to the north of the wood, and pairs of Nissen hut type buildings in the vicinity. 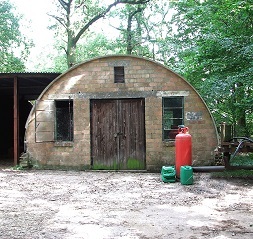 Park's Wood still contains one now quite dilapidated and overgrown Nissen hut which, according to (unconfirmed) local knowledge, once used to be the bomb crews' Doughnut and Coffee shop, but judging from its design and the outlay of rooms it was more likely used for storage. Exactly what purpose the building served has as yet to be established. 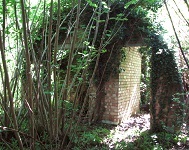 A small brick-built sewage settlement tank adjoins in the west. 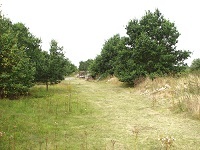 Park's Wood is bounded by Whitehouse Lane, a concrete road and now a public footpath following the boundary line between the parishes of Earsham in the south and Hedenham in the north. It turns off Earsham Road just south of Park's Wood, leading first in westerly direction and then passing the south-eastern corner of Sexton Wood before swinging south where it meets Hogg Lane. Hardstandings for storing HE ammunition can be seen on both sides of this concreted track which today is a public footpath. The hardstandings are interspersed with several small ponds which provided water for fire-fighting. Four Nissen huts stood just north of the junction with Hogg Lane, and beside them there was a pair of Component sheds. No trace remains of any of these buildings. 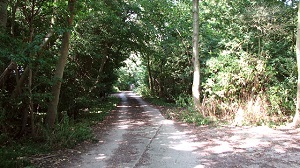 Banham's Lane and Owdall Lane (both also now public footpaths), and Wood Lane (a private farm track), are the approach routes to Sexton Wood from the west, with Holland's Lane linking Wood and Owdall lanes. Bombs were stored alongside Holland's Lane, Wood Lane and Banham's Lane. An overgrown shed part of it would seem to consist of a Handcraft hut can be seen opposite the junction of Banham's Lane with Dulgate Road at Upper Street. During the 1950s it used to house chickens, pigs and cattle on a smallholding called Greenways. Part of it would seem to originate from a Handcraft hut which would have come from the ammunition depot. 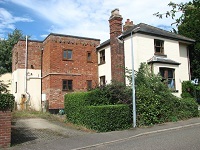 A short distance to the south-east of Park's Wood, where Earsham Road becomes Norwich Road and just south of the junction with Whitehouse Lane, was the location of a Sub-site office. To the north, and south all the way to America Wood, bombs were stored on the roadside verges. The name of America Wood does, by the way, not relate to the use by the USAAF during WW2 as might be assumed, but dates from the late 19th century. NHER has recorded a group of structures and piles of stores on a clearing at the southern edge of America Wood, and a network of concrete roads in Great Wood. The site plan shows that incendiaries were stored along the western edge of American Wood, whereas all the Pyrotechnics and most of the Special SAA (small arms ammunition) were housed in designated buildings in Great Wood (also known as Big Wood), which adjoins immediately to the south. Any buildings in the two woods would seem to have long since been demolished. The concrete roads appear to still be in place. 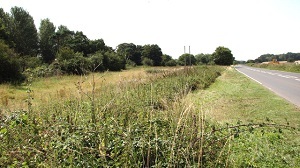 The Earsham FAD had its own railway siding which was located to the north of the track of the LNER's Waveney Valley (Tivetshall to Beccles) railway line between the villages of Earsham and Homersfield, in an area locally known as the Buck Hills. It was equipped with a concrete loading bay and cranes for the unloading of bombs and supplies arriving from ammunition factories. NHER record a 470 metres long concrete hardstanding along the north-west side of the railway line and three buildings, including a Nissen type hut, within a triangular area at its north-eastern end. The largest of these buildings was the Sub-site office. 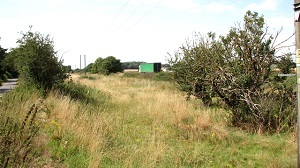 Four more buildings were located along an access road to the south-east of the railway line. 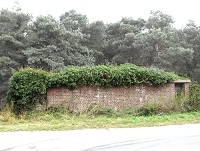 The siding was still in use in October 1945 but appears to have been out of use by April 1946, as was the large salvage area immediately adjacent to the railway track in the south and bounded by the Old Harleston Road. 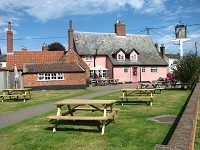 The salvage area, a cattle pasture today, extended west past the Buck Inn, all the way to Buckhills Plantation. The last passenger train crossed the Waveney Valley from Tivetshall to Beccles on 3 January 1953 and the line was finally closed in 1960, at which time the siding is reported to still have been in place. All of the buildings at the site had reportedly been removed by 1963, but a few of the platforms they stood on are still in place. 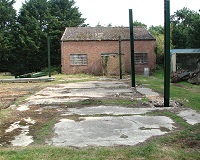 After the war, the Earsham depot continued to be used as a military store, presumably until all unused bombs and munitions had been removed at some time during 1954. According to Wing Commander Mike Wooldridge (in RAF Historical Society Journal 35), in total and countrywide, some 400,000 tons of weapons had to be disposed of - the authorised holding was less than half of that amount, and the responsibility for getting rid of some elements of weapons used by the US forces also fell to the RAF. This included more than 50,000 tons of bombs which were stored in the open several layers high, on verges beside roads and fully exposed to the elements (these roadside storage facilities were not finally cleared until as late as 1951). With in excess of half a million tons of high explosive and incendiary bombs, and tens of thousands of tons of chemical weapons, Group 42 quickly realised that it had a serious problem regarding the question of disposal of these stocks (although some would be required for the Tiger Force and the war in Asia). Initially, disused airfields were used for storing the obsolete munitions (typically, an airfield could be expected to safely store 15 kilotons of explosives on its runways, taxi tracks and hardstandings), and as more and more airfields were handed over to the group in the years following the end of the war, there were only a few operational stations left in eastern Britain, scattered far and wide and surrounded by a great number of ammunition storage airfields. Despite warnings to all pilots, and white 'landing prohibited' crosses sprayed onto the ends of the runways, at least one pilot, Naval officer DH Dominie, brought his aircraft down amidst piles of bombs stored on the runway at RAF Attlebridge in October 1945. It was eventually decided that the only sensible ways to dispose of the volumes of heavier bombs involved was to either return them to ordnance factories for boiling out; to demolish them locally (frequently on disused bombing ranges); or to load them onto ships to be dumped in deep water. A number of vessels were used, sinking 42 kilotons of weapons in water off the Hebrides and beyond the Continental shelf within six months. More controversially, a shipload of chemical weapons was dumped at a location which allowed the tidal flow to carry any fall-out to the Norwegian fishing grounds. In January 1949 there was a preliminary proposal to provide storage facilities for the USAF in Europe. 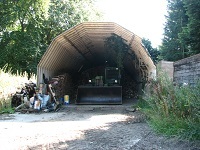 Visits were made several months later to four East Anglian sites - the Forward Ammunition Depot at Earsham, the airfields of North Pickenham and Little Snoring in Norfolk and Tuddenham near Mildenhall in Suffolk - and in early June 1949, 280 MU (Maintenance Unit) was formed at Earsham. It was also proposed that the other sites would become sub units and store a total of 19 kilotons of HE, plus 11 kilotons of incendiary, but plans changed when North Pickenham became 281 MU and assumed control of the other two airfield sites. 100lb from Germany were stored at Tuddenham and it was decided that the second sub unit at Little Snoring would not be required after all. The only memorial associated with Station AAF 545 can be seen in Earsham All Saints church. The tablet is dedicated to Private 1st Class Louis A Whitechester from Los Angeles, who served in the 44 AAF Mess Squadron and reportedly attended this church when stationed in the area. The memorial was commissioned by Mabel Emily Marston from the Marston family, who owned Earsham Mill and after whom Marston Moor is named. According to local knowledge, Mabel, who never married and later used the surname Chester, was a close friend of Louis Whitechester. 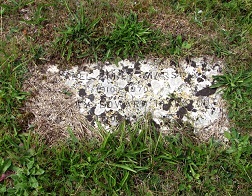 She died in 1970 at the age of 60 and is buried in All Saints churchyard. Louis Whitechester was single with no dependents at the time of his enlistment on 29 May 1942, but one of the documents available to view online is his marriage certificate, suggesting that he died (in active service on 31 August 1946) a married man. He is buried in plot 142 E 18 in the Los Angeles National Cemetery. In 1943, an aviation fuel depot was established only a few kilometres down the road from the Earsham FAD, on the edge of the Ellingham Marshes south-east of the village of Ellingham on the River Waveney, which forms the border between Norfolk and Suffolk. Like all other ammunition and fuel depots in the UK at the time this depot was controlled by 42 Group RAF. There would not seem to have been any contact between the two sites. It was located south of Geldeston Road in the village of Ellingham near the junction with Braces Lane and about five kilometres north-east of Earsham, and connected by rail to the ports of Great Yarmouth and Lowestoft. It had its own railway siding, actually a loop, on the LNER's Waveney Valley Line, from where the fuel was piped under Geldeston Road from the railway tankers into the depot's storage tanks. The loop turned off the railway track about 200m east of the bridge which takes Church Road over the cutting. It was about 440m long and ran parallel with Geldeston Road before turning northerly once again and rejoining the line about 40m west of the level crossing on Braces Lane. The responsibility of the depot was to supply aviation fuel to combat airfields in the region and 42 Group (as at the Earsham FAD) was responsible for checking deliveries, reserve stocks and depots to ensure adequate supplies. Major civilian oil companies had however been contracted to maintain the tankage owned and rented by the Air Ministry, using civilian labour. At the outbreak of war, the government formed the Petroleum Board, which then assumed the Air Ministry's responsibilities, and 42 Group continued to check that the Petroleum Board was keeping up with the RAF's (as well as the USAAF's) demands for increasingly more petrol, oil and lubricants. As it was common practice for aerodromes to use their own road tankers and local contractors for transporting bulk fuel to their on-site fuel installations, RAF or USAAF personnel were not based at the aviation fuel depots. 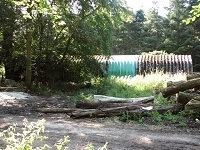 The type C1 fuel tanks at the Ellingham depot had a combined capacity of 2000 tons and were bunded to prevent spillage. They are reported to have stood on the site until the 1980s, as indeed the site had been used for the storage of fuel by one of the big petrol companies (Esso ???) for many years after the war. In the late 1980s, Ellingham Grain Ltd converted it into a grain store and the old fuel tanks were demolished to make room for silos. Most of the adjoining structures, including two prefabricated buildings - one formerly used as an office, the other as a garage for light maintenance and both now converted into offices, a vehicle garage, and a small electricity sub-station have however survived. An aerial view taken in 1946 shows two more buildings adjacent to the vehicle garage in the south. 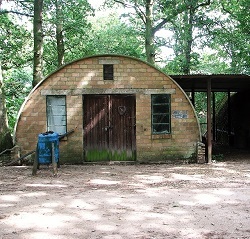 One of these was the Canteen, housed in what would seem to have been a Nissen hut. It was adjoined to the east by a similar hut where lorry drivers could rest when not on call. A surface air raid shelter (both entrances blocked) can still be seen across the road from the entrance. The railway trackbed was removed after the line closed, but the course of the sidings can still be glimpsed and a few of the old concrete fence posts are also still in place. Mollie Barber, who at the time was 16 years old and worked at the depot as an office girl from 1943 until it closed in 1946, remembers that the transport manager and another senior office worker were the only other permanent staff. 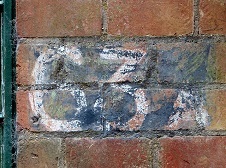 Mollie also recalls that the station number was 'AF DD342', and that four civilian lorry drivers regularly called in to pick up fuel for the following aerodromes: Seething > Link (USAAF Station 146), Flixton (Bungay), Thorpe Abbotts > Link (USAAF Station 139) and also occasionally for the naval base at Lowestoft harbour which had a large underground fuel tank for use by minesweepers, Motor Torpedo Boats, and other warships on the northern shore of Oulton Broad > Link - Link , and rarely, Ellough (Beccles) > Link . 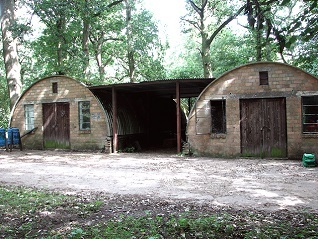 As the operation ran 24-hours a day, with fuel coming in and going out almost constantly, sleeping quarters had been provided for the drivers in a Nissen hut adjacent to the Canteen. 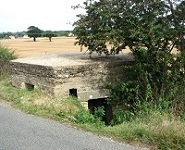 A standard type 22 pillbox with stepped embrasures and wood shuttering can still be seen guarding the bridge over the railway line about one kilometre further to the west. Referring to this pillbox, the NHER recorder comments that "the absence of any WW2 aerial photographs makes it impossible to tell if it was supported by any other defences (J Albone, 2006)", yet again indicating that NHER's assessments would seem to be primarily desk-based and that conclusions are being reached mainly by looking no further than at the aerial photographs most readily available to them. Mollie Barber, together with other local residents in her age group and happy to share their memories when asked, clearly remembers the presence of Army personnel, with numbers varying from two or three, and at times up to 20, depending on what was happening. The soldiers were hutted on a piece of land between the aforementioned bridge and Ellingham Mill > Link . The hutted camp as well as the searchlight - removed at the end of the war and hence missed by all those who look at aerial photographs and no further - was situated nearby. My grateful thanks go to the farmers who kindly permitted access onto their land, and to the staff at Ellingham Grain Ltd for permission to take pictures of the wartime buildings. Many thanks to Mrs Mollie Barber for generously sharing her recollections of her time as an office girl at the WW2 fuel depot at Ellingham, a site about which to date very little is known, and to Adrian Pye for kindly recording these. 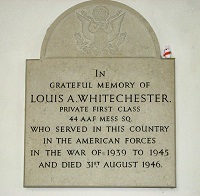 Thank you very much also to Mrs Sally Thomson from the Earsham Benefice Office and to a former churchwarden for very generously helping with information concerning Louis A Whitechester's memorial tablet in All Saints church.